Modified Bitumen systems combine exceptional elongation and fatigue resistance properties with the strength of a glass-reinforced polyester mat and are available in white, black, and other granule surface colors. The rolls of these roofing materials are factory-manufactured, ensuring quality control, and are well suited to expand or contract with the movement of the building they protect. 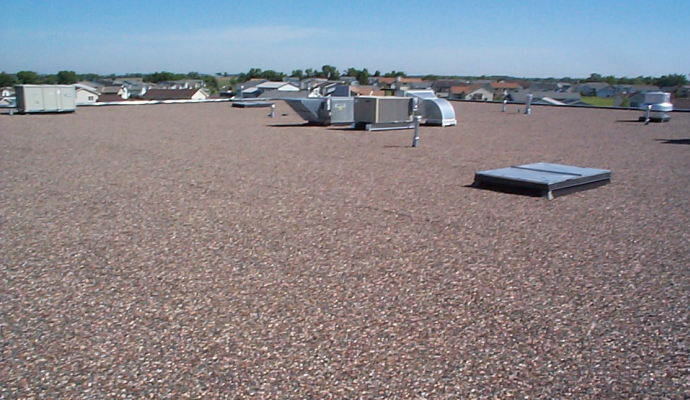 The drawbacks to BUR and Modified roof systems are they are susceptible to advanced and aggressive deterioration due to standing water, grease (such as what is found on restaurant roofs), and UV rays. BUR and Modified roof systems also are not considered “green” roofs and therefore do not offer heat reflectivity or emissivity and do not qualify for potential energy savings and rebates. coating), insulation layers, deck type, and installation method, BUR and Modified warranties range from 10 years to 20 years. However, most BUR and Modified warranties exclude standing water.